and create something with it. The idea is that it could be anything. 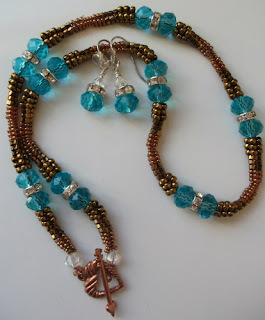 I had the urge to put copper with the aqua coloured beads and decided to keep things classic after letting go a few of my wilder ideas. The photo below shows the finished necklace and matching earrings. I used herringbone weave in graduating seed beads, some hex ones thrown in for a bit of texture and feel the finished product is pleasing on the eye. The design can be worn with the toggle at front or back, for a different look. And the other blog participants are listed below. Please visit them and leave comments to join in the fun. Jean - Snap Out of It Jean - There's Beading to Be Done! Lovely combination. Beading is one of the things on my "bucket list". My mom was great at it, but never picked it up from her. Heather, Your necklace and earrings are very pretty. I enjoy doing the herringbone stitch is is easy and versatile. You did a wonderful job with this challenge. A beautiful piece! I like how you warmed it up with the copper. What a great challenge! Your design is the first one I have seen that used the spacers! But with the copper it works. The copper gives it a rustic feel, full of warmth and sparkle. Great job. Love what you did with the beads. The combo of copper and aqua looks great. The herringbone stitch is not one I have tried yet but it looks great with what you did. The copper and aqua are lovely together. I love your final design. The herringbone stitch gives a lot of texture. I love the copper and aqua combo! Herringbone stitch does add a lot of texture. This necklace is definitely the kind you want to touch. You're making me want to pull out my seed beads again! Thanks for joining the challenge! Great bead work and lovely color combo! Oooh, I like the way you warmed it up with the copper. Very nice! Love how the copper warms up the piece and moves it from icy blue to Springy blue! Lovely! I love this cool design and theearrings, too! Very pretty!! I love the herringbone with the graduated beads. It gives the piece a lot of movement and softens the blue. Love the colour combo, aqua and copper are a great pairing. I do love pieces that make a feature of the clasp and I think you've inspired me to try beading with seed beads. What a gorgeous necklace and earring set! Your work is stunning...and I love it when you can wear a piece with the clasp in the front or back! Very pretty, I love the aqua and copper combo.